Imagine telling the good folk of 1990 that in the near future, we’d be redesigning hospitals to accommodate the influx of obese patients. Or that almost all of our sporting legends would be contractually obliged to advertise alcohol. Or most kids would be driven less than a kilometre to and from school. Twenty-five years ago, these things were unimaginable. Yet, in 2016, here we are. One might rightly ask how Australia’s health got so bad in such a short time, why our children are growing out before they grow up, and why nine out of ten of us will die from a preventable disease. Back in 2009, I chaired a panel that made a number of very clear recommendations about how to start turning the tide on chronic illness. This year my colleagues and I have taken a critical look, in the Medical Journal of Australia, at how much progress we’ve made to address the recommendations we made in our National Preventive Health Taskforce report, delivered to the Commonwealth Government seven years ago. The short answer: not much. Why? Because virtually no money is being dedicated to preventing illness before it occurs. It’s all funnelled into the treatment end of the system. In the face of a looming health crisis, our country lacks the sustained, comprehensive, strategic approach, adequate funding, and coordination. We need all sides of politics to take these issues seriously, to support effective policies and water down the alcohol and junk food and junk drink industries that currently are undermining our health. In the Medical Journal of Australia, we argue that we are losing the war against alcohol and weight-related illnesses because our nation lacks a comprehensive approach to prevention. Non-communicable diseases are responsible for nine out of every ten deaths. Seven million Australians currently live with chronic illness. Of the recommendations we made in 2009, 27 were obesity-specific. Three have been reached, seven not started and 17 are crawling along with some progress. Of the 32 alcohol harm-reduction targets, four have been achieved, there is progress in 18, and ten have not even been looked at. For all the goodwill and expertise we have right here at home, we are seeing a widespread implementation failure. The problem is not a lack of expertise or an engaged workforce to carry out this work. Our University Schools of Public Health are producing wonderful graduates, but there are hundreds of dedicated health promotion workers who are perpetually frustrated that the money just isn’t there to fund their programs. Unfortunately, the one federal agency set up specifically to run health promotion in Australia, the Australian National Preventive Health Agency, was swiftly dismantled by the Commonwealth Government in 2014 before it really had a chance to achieve anything. And with the demise of the national agency, the states and territories lost $400 million set aside for prevention. This blow to the prevention sector showed depressing lack of vision, given the huge body of evidence that shows preventing illness saves the health system millions in the long run. As it stands, 1.5 per cent of recurrent health funding is channelled into public health and illness prevention, which is nowhere near enough to scratch the surface. The Australian Government invests far less than our cousins, New Zealand, Finland and Canada. Yet we know that obesity will become a worsening public health emergency over the next decade. 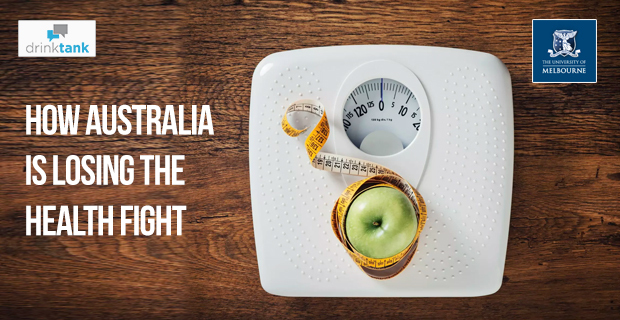 Australia ranks fifth in the world for obesity rates and it’s getting worse as each year passes. High body mass and physical inactivity account for 60 per cent of the health burden of type 2 diabetes. Men have packed on an average 6.5 kilograms over 25 years to an average 85.9 kilograms. Women have put on 5.7 kilograms over 25 years to an average 71 kilograms. Half a million of us have a Body Mass Index of over 40, which is in the morbidly obese category. And this can lead to devastating chronic and often fatal conditions such as diabetes, heart disease and cancer. This is a collective problem, not an individual problem. To get back to our lighter selves, we will have to tackle this together. That means showing public support to get rid of blanket advertising of alcohol and junk food and sugary drinks and its bizarre relationship with sports. It means supporting a tax on sugary drinks. It means facing up to this country’s alcohol problem and supporting taxes on the products that are making us sick. We’ve had such great successes with tobacco control in Australia and are renowned as leaders in the space. We should be leading the world in obesity and alcohol-harm reduction. Managing non-communicable diseases in an ageing population is fraught with difficulty and as is often the case, the effects will be most profoundly felt by our indigenous peoples and our low-income earners. We devote far too little to prevention policy, funding and implementation. There’s a lack of ingenuity, political and community courage to face these issues head on, as we have done in the past with tobacco. Australia has a lot of catching up to do to comparable nations but we keep missing the targets, particularly on healthy eating, healthy weight, and the short and long-term impacts of risky drinking. Just imagine if we’d instituted policies and programs back in 1990. Imagine how hundreds of thousands of Australians, perhaps even millions of us, would now be healthier, lighter and much happier than we are now. This post first appeared on The University of Melbourne’s multimedia platform Pursuit and has been republished here with permission. Makes you wonder how much of this is driven by the world drug companies, i.e. The billions of dollars they would lose if the world was a healthy place! Where would they make their billions then? There is no question that governments are in the pockets of the drug companies.